Kayla recommended that I check out Carol W. Costenbader's The Big Book of Preserving the Harvest, and since the text was available at my local library, I figured I didn't have anything to lose. With chapters on canning, drying, freezing, jams, pickles, vinegars, and cold storage, this initially looked like the go-to reference for every well-rounded homesteader to have on her shelf. Closer scrutiny, though, showed that the recipes included are more fancy and less basic than you'd want if this was your single reference guide. 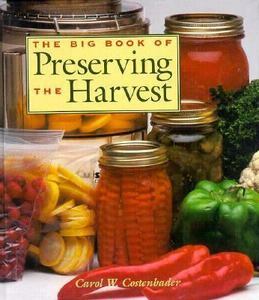 On the other hand, The Big Book of Preserving the Harvest shines in the chapter introductions, where Costenbader walks you through all of the basic techniques for each preservation method. I was particularly taken with the canning section since I haven't canned extensively and didn't know that people at higher altitudes might need to leave more head space (so that's why my peach sauce erupted!) and that minerals in your water can cause the top layer of canned food to turn brown or gray even though it's still perfectly safe. When I first started the book-learning part of my homesteading education about 15 years ago, Stocking Up seemed like the best option for an all-around basic preservation guide, but since then I've mostly gravitated toward websites. What resources do you use when you want to know how long to blanch your green beans before freezing and how much head space to leave on top of your canned tomatoes? Our chicken waterer keeps your hens happy so you can have more time to make jam. Still mainly use the Blue Book and then Google after that. I have canned and jammed for awhile, and I can not recommend highly enough Linda Ziedrich's books "The Joy of Jams, Jellies, and Sweet Preserves" and "The Joy of Pickling". She gives fancy recipes as well as the bare bones ratios for diy style preserving. Our go-to canning (freezing, drying, etc) book is So Easy To Preserve from the University of Georgia ag extension service. The chow-chow and relish recipes alone are worth the price of admission. I've got the Ball book, but I find i most often go online to look for something specific, and for basic canning pickyourown.org has canning instructions for just about any fruit or veggie you might want to put in a jar. I dont have very much freezer space, and here in NM, it is paramount, a d maybe even required by law to have a good stock of roasted green chilis in your freezer, so my freezer space is taken. Canning, and dehydrating are the biggest ways I preserve, also fermenting and pickling. My new favorite is to dehydrate tomatoe slices till they are super dry, then grind them to a powder in The food processor. This powder is a fabulous addition to sauces or soups, and serves as instant tomato paste with the addition of a little water. I throw one of those dessicant packets in ghe jar with my dehydrated stuff, just to keep it really dry. I've used the preserving information found on www.pickyourown.org. The website is kind of hokey but there is good information. I like Put 'em up by Sheri Vinton. The begining is full of information and techniques while the back is full of recipes.